Apparently BGA is one of the largest wholesale distributors on the island of Bermuda, supplying more than 20000 different items to Bermuda. 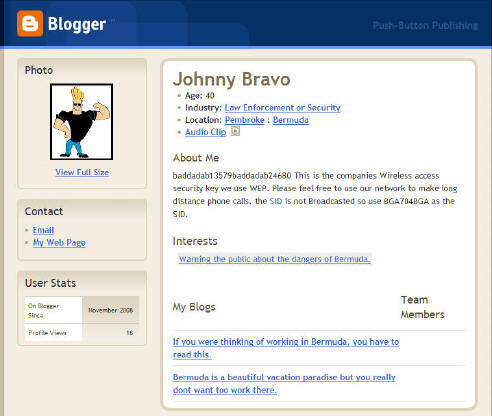 this site circulated the details of the blogger's post on the 22nd December 2008, on the 23rd December the entry appeared to have been removed. baddadab13579baddadab24680 This is the companies Wireless access security key we use WEP. Please feel free to use our network to make long distance phone calls. the SID is not Broadcasted so use BGA704BGA as the SID.